These are some photos that have been making the rounds on the internet. I saw them on SurvivalBlog last night, then today a reader sent them to me independently. These were taken on Jan 7, 2011 in the Trussville, Alabama Walmart just before the snow fell. And oh yeah, "preppers" are still a bunch of nut jobs. 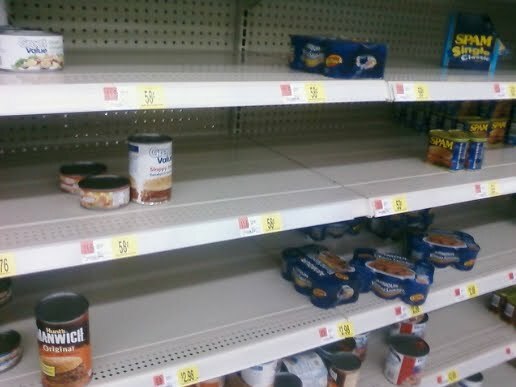 But think about this: we'll never have to fight over a loaf of bread or a can of chili at Walmart before four inches of snow falls. Just a thought. Amen, sister! I saw this on the news late last night. I was thinking the same thing - we preppers would be able to take it in stride and leave the panic and chaos to those who were oblivious to the obvious. If you are ever looking for another subject to write about, I would like to see some ideas about meals that can be put together with just a few basic scratch ingredients that someone may have on their shelves. Maybe all of your readers could chime in with their favorite simple scratch combos so we could all get some new ideas to print off and keep in our food storage areas. I am going to be doing a small group for my church on this subject because a lot of people come to me asking for help with scratch cooking. With the amount of requests I get I am beginning to think it is a dying art and would love to help people out. When I saw the picture of the empty shelves the first thing that came to my mind was my mom's old standby when the cupboards were getting bare--Spanish Rice. She would make a pot of rice (we ate a lot of rice!) mix in canned tomatoes, some spices and garlic, then fry a pound of chopped bacon to mix in with it and pour it all in a casserole dish. Shredded cheese topped it off and it was baked until bubbly. I swear we grew up eating that 3 days a week, but to this day it is one of my favorites. The thing I don't get about it (the bread isle anyways), is out of all the things to stock up on, why WHITE BREAD? The most Un-nutritional thing I could possibly think of. Do these people think they are going to get their three loaves of white bread, gallon of skim milk & then think they'll come out after the storm the only survivors because they had a couple of loaves of Wonder in their house? 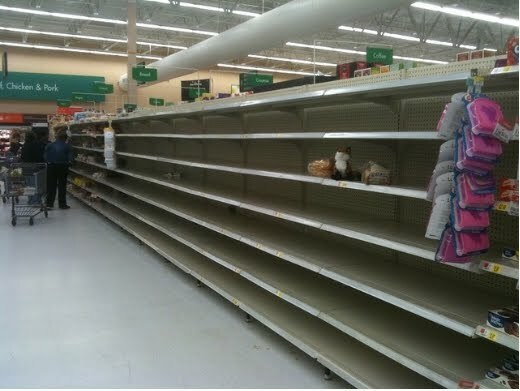 I'm sure the same thing happens here, but we're lucky enough to not have to make a Walmart run right before a storm so I've actually never seen an empty bread isle. I love this post, Patrice. It's a great point. I'm in FL and our stores look like this every time there is a threat of a hurricane. Most homes have at least a Rubbermaid of emergency supplies (flashlight, tea candles, first-sid, etc.). It's strange that some folks can't, or won't, think ahead. Actually I guess it's the majority now that don't think prep for the bad times so they can relax a bit when the SHTF. I have seen this sort of thing before and I always wonder just what were all those people going to do for food the next few days if there was no snow predicted. WOW, Very sad and it is for only 4 inches. I am glad that when it rained here and places were flooding and water was creeping towards peoples front doors, I just sat back and relaxed. I live on a hill, on a raised (3-4 ft) foundation and on another hill above the valley. I also had the food and water I needed just in-case the flooding caused the town to shut down the water supply! IT PAYS TO BE PREPARED....Now only if i can get prepared to where I want to be, SIGH one step at a time I guess. We have a fairly new WalMart (< 1 year opened). I went by on my way home from work tonight to pick up some hand sanitizer. We aren't having any bad weather or other emergency, and it looked almost as bare. The flour, sugar, nuts and dried fruits aisles had lots of empty shelves. Of course, the hand sanitizer shelf was also bare. Not sure what is going on but it was fairly creepy. Glad I have most of what I need -- just wanted to rotate some stock! Growing up we were dirt poor. If I was hungry enough I would eat onion sandwiches. Necac/WIC gave my mother butter and for some reason we always had onions in the house. If there was white bread then it meant I wouldn't starve before school lunch came. White bread, while not good for you, sure does take the pain away when you are starving to death. I had a strange dream two nights ago. In my dream, "hard times" had been going on for an extended period of time but our family was doing okay. I was aware that I was operating with only 50% of my current stock level, yet our needs were met. I understood that if I had not squirreled away every possible thing I had put up, we would not have been doing so well. I immediately woke up and remembered the dream clearly and thought "I need to stock like my life depends on it, because it does." My security is in the Lord, not in my stock, but I also know how to follow instructions when I think I'm hearing God. Peace and Blessings be yours! Having been born in and lived in Alabama all of my 49 years, I have observed this and other things like it many times ( during ice, snow, hurricaines, tornados, fire, floods, etc.). You would think that people would learn from their past experience/mistakes and say, Hey! I think I'll go ahead and get/make/repair what I think/know I'll need so I won't have to do without/run around at the last minute like a chicken with my head chopped off ( I'm a true Southern redneck; I really do speak that way! ). Unfortuantly it's not just a food thing--people here also slow down to a crawl on the Interstate when it starts sprinkling rain, then drive 80+ mph in snow & ice. Having said all that, I'm very thankful that my Daddy was raised in a large family that came through the Great Depression ( as sharecroppers---he learned to plow with 2 mules named Ader and Ider) and that he passed along a lot of the same values/skills/mindset to me. My wife ( whose mother was raised as a country girl in a somewhat similar manner ) and I can see that what's coming appears like it will make the GD look like a "Sunday School picnic". We are concerned about those around us--most of whom act like the people in the Walmart mentioned above and our warnings to them seem to fall on deaf ears. No one appears to want to learn what REAL sustainable living/preparedness is about BEFORE it's a do-or-die situation. My wife ( a VetTech trained in large and small animals ) and I ( jack-of-most trades ) can and had tried to teach/train/advise others, but we find that those who want to learn are few and far between. They want the fish, but not the fishing. They are blindly ignorant of a very important fact, that is: Learning is the price of life. If one refuses to learn, one will, most likely, hasten one's going. As it is, life is already very, very short. Thank you ( + Don & the girls ) for taking the time to teach others what you/ya'll know. Hope I didn't take up too much of your time and space. ( By the way, that "redneck" claim above? It's real---I hand-loaded pulpwood as a teenager; one trade learned among many ). I can't beleive people left Vienna Sausage on there....that stuff is pretty good, albeit not very healthy! Once upon a time, I worked for WalMart. They used to have good sized back store rooms where we could store food overstocks that would not fit on shelves. Even then, we were transitioning into a system where all of the ordering would be automatic. Within a couple days time of an item coming close to it's inventory end, we would receive the next quantities by truck. Our back room storage inventory became smaller and smaller. Now, if something happens to throw a glitch into this ordering process (storms delay trucks, computer glitches, theft which interferes w/ true on hand inventory count etc)you will see a lot of empty holes where stock should be. What I am finding interesting around here, is that we have a WalMart and a Goodwill store. This year, the Goodwill parking lot has been full w/ people waiting for parking spots. WalMart, outside of food, really wasn't all that busy, even a Christmas. Sadly, I just read an article that one of our local groceries will be closing it's doors next month. This grocery store was well utilized by the community, but is still falling victim to the hard economic times. I'm thankful I have skill to cook from basic ingredients and have a good supply of pantry items and various ways of using them if power is affected. I am also thankful for your blog. It brings me a mix of education, commentary and humor. It keeps me well balanced in these crazy times. This is what the stores in Houston looked like before Hurricane Ike. Right after, the stores had policeman at the doors letting 2-3 shoppers in at a time and things were very strictly rationed (1 doz. eggs, for example) No bread. No fresh (or frozen fruit and veg). Thankfully I have a gas stove so I was able to bake bread (made some for the neighbors, too) even though it took a while for electricity to be restored. - OH, and the problems after Ike in my area were almost ALL from a lack of electricity, not water/wind damage or anything else. Just no power. Couldn't drink the water. Couldn't go to the store. Couldn't cool the house off. I personally spoke to a Kroger upper level manager who told me that they did go by the "3 day supply" rule but stocked up to "7 day supply" levels when a major event (blizzard, hurricane, etc.) was predicted. This is such a great thread. I'm lovin' the comments. "Flippin beam me outa here, Scotty." There was a time when a picture like this would say, "It's January. Time for inventory, which is most easily done with minimal stock on hand." But in these times, I regret to say Anonymous @ 7:20am has it right. Although I'm not as stocked as I'd prefer to be, I thank God I'm well able to avoid going to town when the stores look like this. Not that they generally do so here, with the possible exception of Walmart. They've been showing more and more shelf and less and less stock for over a year. It's so good to read all these posts and to see new folks. Hey, AlaRedNecks and others, and hey dear regulars. Ouida, tomato sandwiches. lol AP, BOOYAH! and GmaT, biscuits and gravy! I'd love to stay a while, but I need to go get that yard-bird in the oven 'cause the hands are headed for the house. am unable to type and rant at the same time. The massacre in Arizona took place in Pima, NOT Pinal County. I specifically apologize to Sheriff Paul Babeu of Pinal County. You may recall his was the deputy murdered in the line of duty not long ago during a confrontation with an illegal alien. Sheriff Paul and I had recently exchanged e-mails, so I suppose that accounts for my discombobulation. I've written from time to time on these subjects, and covered this ground before. In the 1970s someone posited that there was approximately 30 days worth of food in the country at any one time. In factories, warehouses, sitting in railcars and trucks, and in stores. Now north of 300 million sheeple and with the miracle of "just-in-time" inventory management and manufacturing I can assure you it's now much, MUCH less. Once upon a time store shelves were deep, well-stocked and if empty you just found a "stock boy" and he fetched some from "the back." Those days are gone; there isn't much on the shelf to start with and there IS no more in back. Johnny Carson once told a JOKE about a toilet paper shortage and within 24 hours you couldn't buy toilet paper. We have woven an incredibly complex and fragile supply chain web. One or two little strands go "ping" and as soon as word gets out, if you're not standing in an aisle in the store AT THE TIME, you might as well stay home. And it won't matter if the problem is real or rumor. Ample reason to stayed well stocked, and ALSO reason to keep your radar warmed up and turning, being aware of what's going on in your town, state, and country. Any warning may be better than none.